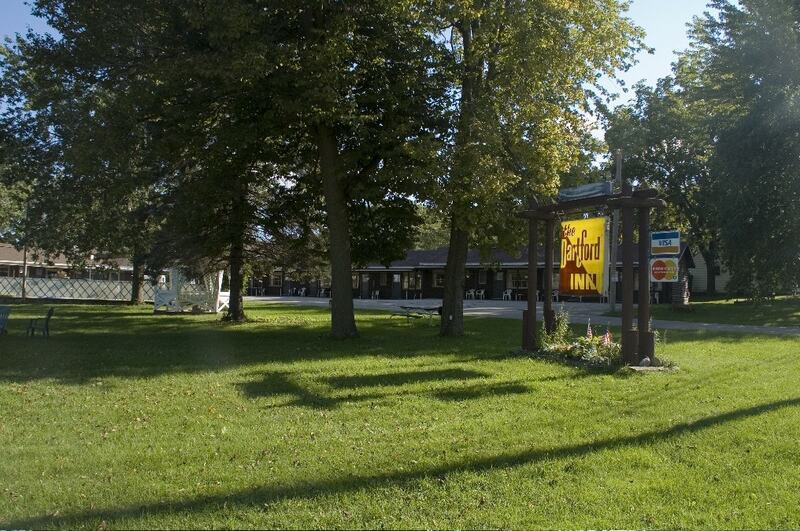 Established in 1949, the Dartford Inn has served generations of travelers and residents as a rustic, natural abode in Green Lake, Wisconsin. Located on the west side of the Puchyan River, the Dartford Inn is described as a “log cabin style motel,” spanning across five wooded acres. Owned and managed by Larry Hulbert and his partner David, the Dartford Inn is tailored to those who love the outdoors and a quiet place to rest their heads. Inn Manager Larry says, “the one thing I like to toot my horn about is that we’re the only motel in the Green Lake area that has an outdoor pool.” He continues by adding, “we’re a very friendly place – pet friendly, too. If you don’t bring your own pet, we’ve got four kitty cats and puppies running the motel.” While at the Dartford Inn, tourists can find a number of outdoor activities to do like fishing, boating and hiking. Before getting into the motel business, Larry was working with developmentally disabled adults – training and working alongside them as they looked for employment. He also supported older adults with disabilities as they went into retirement homes. David has worked as a high school special education teacher and majored in special education during his years at Pitt State University in Kansas. After serving five years in the Navy, Larry also attended Pitt State for computer science but found that his outgoing personality was not equipped for a cubical job. Larry and David have been together for 28 years. As Larry says, “we’re just a typical couple – putting up with me is one of the special things about David.” Originally from Kansas, Larry and David had also lived in Oklahoma and now reside in Northern Wisconsin. Never known as city people, Larry and David have become accustomed to living in rural areas and knowing small town values and hospitality. They finally settled home in Green Lake while running the Dartford Inn. For more information, visit their website, www.DartfordInn.com.